The 2010 Eisner Wards have recently been announced and my favorite publisher, Fantagraphics, has been honored with a record 18 nominations. Of these I would like to draw attention to one particular nominee that I feel deserves special recognition: You’ll Never Know Book One: A Good and Decent Man by Carol Tyler. Included in the Eisner category “Best Painter/Multi-Media Artist” You’ll Never Know is Tyler’s auto-biographical graphic novel (the first of a proposed trilogy) detailing her attempt to understand the personal history of her father and how it shaped him into the man he is. Of these experiences, those she is the most curious about are also the ones of which he has always been tight-lipped: his time served overseas in the Army during World War II. A keen observer of human behavior, Tyler notices from an early age that veterans of the War seem to have a kind of unspoken fraternal similarity in that very few ever mention the great conflict in any way, let alone share personal tales from it. This occurs to her in her teen years at a father/daughter dance as she mentally notes that nearly every man in the room has taken part in the War (and likely seen action) in one facet or another. 35 years after that dance Tyler, now the mother of a teenage daughter and separated from her husband, is beyond surprised to receive a call from her dad who now, late in life, seems ready to discuss the things that happened in WWII. Videotaping her father’s as he tells his story, and borrowing his photos from the war, Tyler begins to assemble a new scrapbook of this time from his life. This section of You’ll Never Know is (but one area) where Tyler’s wonderful graphic sensibilities come into play as the book we are reading doubles as a scrapbook itself, filled with scenes directly depicting her father’s tales. As Tyler begins to better understand her father and how the past shaped him, she realizes how her upbringing had in turn affected her relationships with men. It is in these passages that we see how parents can profoundly affect not only their children, but their childrens future relationships, in a myriad of unintentional ways. It’s a stark reminder that kids are much smarter than we give them credit for as they are constantly picking up things from adults that we think is too far beyond their understanding to have any kind of negative resonance. 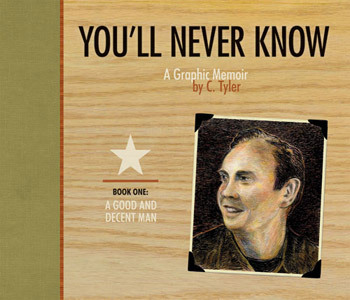 The oversized 8 x 11 format of You’ll Never Know is a superb showcase for Tyler’s fluid, often highly-detailed, line-work and beautiful water-colors. Her outstanding page lay-outs weave the past and present together seamlessly in a way that is reminiscent of that all-time gold standard of sequential auto-biographical storytelling, Spiegelman’s Maus. And while You’ll Never Know and Maus do share more than one surface similarity in terms of theme and subject matter the real link between the two lies in the story of men who survived the horrors of World War II only to bury their memories deep within themselves to their own detriment. They are members of a generation born far before it was acceptable for a grown man to expose vulnerable emotions to others. Carol Tyler is a long standing (and highly acclaimed) member of the alternative comics community, yet You’ll Never Know is so finely and delicately crafted one feels that this is the first chapter of her masterpiece, the project that all of her talent and experience has been leading to. Tyler’s journey through her Father’s personal history is not yet over (his troubling time in Italy during the War has, as of now, only been hinted at) and I very much look forward to where this highly intimate, yet often emotionally universal, personal journey goes from here. Although many talented and deserving individuals are nominated for this years Eisner’s I hope above all that Tyler takes home an award for this exceptional book, without question one of the very best graphic novels of 2009, and an outstanding example of the levels of emotional complexity possible via sequential storytelling.